We spent the first Sunday of 2015 at Knockhill Race Track watching a rally stage It was a bitterly cold day but we wrapped up warmly and thoroughly enjoyed seeing the cars going round the track and the race teams tinkering with them between the sessions. Euan and Daddy were delighted to find a Skoda in amongst them! Euan is back to his 3rd term in P3. One of his tasks for this month was to learn a piece of Scots poetry - The Puddock. He did very well and was awarded a 3rd place certificate for his efforts. Euan also had a special mention and certificate in school assembly for using 'excellent description in his writing'! Daddy has been very busy with the model railway in the loft - if you take a look at the 'trains' page on the website you can track the progress. Mummy has been using the Great British Bake Off book she received for Christmas to help bake pecan shorties and Grasmere gingerbread. Next on the agenda are homemade digestives! It has been quite cold and slighly snowy here in January - Euan did have the cold one weekend and was a miserable little soul. However, he bounced back from this quickly and is his usual self again! February might have been a short month but we packed a lot into it! At school Euan received a certificate and special mention in assembly for some superb descriptive work he had produced in class. The whole class also celebrated their 100th day in Primary 3. Euan looked rather smart on his arithmetically decorated T-shirt! Of course, there is Valentine's Day in February but Euan didn't feel there was anyone he wished to send a card to this year - phew!! Just to be on the safe side, he did make some pink heart cookies for his teacher! Cousin Angus was 20 this month, so Mummy and Euan were delighted to join in with his birthday treat - a visit to Edinburgh Zoo! A fabulous day out along with Auntie Rosemary, Uncle Brodie, Kate and Fay too. The highlight of the day had to be Euan's commentary on the antics of the horny Rhino's!! Euan had a few days holiday from school in the middle of the month so we all went off on the train, down to York for a couple of days. We had a wonderful time, with visits to the Jorvik Centre and Railway Museum. Mummy met up with her friend Colette for lunch which was a lovely treat. We headed back up to Berwick-on-Tweed for a night in the new Youth Hostel and to catch up with Auntie Gillian for the evening, before heading home. Euan (and Daddy) have braved the wintry weather to go along to rugby training on Sunday mornings. Euan is still enjoying taking part and is a very good defensive player! At the end of the month we had a family outing to the cinema to see the Shaun the Sheep movie - everyone thoroughly enjoyed it! March was a reasonably quiet month for us with not a huge amount happening. Rugby training for Euan continued on Sunday mornings and the team played a couple of away matches at Dunfermline and Forfar. Euan continues to be a good defensive player with other spectators noticing and praising him. Mummy and Daddy have taken turns at having mild hypothermia watching the training!! Euan dressed up for World Book Day. The theme was a book hero so Euan decided on Mr Strong and the challenge for Mummy to produce a costume was on. However, two red pillowcases, a piece of foam, some black felt, a sick bowl and some green paint was transformed into something suitable. We also had parents night at school this month. Euan continues to do well at most things but he needs to practice skipping and ball catching to help with his co-ordination! Mummy had a week off work to use up some annual leave. She took herself off to the cinema to see something that didn't involve animation. She also found a lovely new wool shop in Dundee and is currently knitting a scarf with the yarn she purchased. To round the week off, she met up with her friend Rosie in Perth and had a lovely wander round and leisurely lunch! Most of April was taken up with school Easter holidays which started on the 2nd and ended on the 21st! We managed to get away for a camping trip over the Easter weekend to Rothiemurchus near Aviemore. The weather was reasonably kind to us and we managed to fit in a visit to the Cairngorm reindeer herd, a bike ride round the estate, a little bit of canoeing and plenty of eating! The Easter Bunny even visited!! Daddy has a few days off to travel down to Esssex to visit Uncle Bob and Auntie Irene. On the Friday before he left, we had a trip out to the Bo'ness Motor Museum. Daddy and Euan were thrilled with some of the vehicles on display. Whilst Daddy was away, Mummy and Euan had a trip into Dundee to visit the science centre. We both had great fun, especially with the interactive forensic exhibit which involved crime scene suits and having our fingerprints taken! We did try to be a little more active in April with a few cycle rides but these have been curtailed by the weather turning wintry again - hope Spring arrives soon. Euan is still enjoying his rugby on a Sunday morning. The team travelled to a tournament at Currie but unfortunately lost too many of their matches to go through to the next round. Hopefully they will do better at the Perthshire tournament next month! Euan's higlight from the end of the month was his "Star of the Week" certificate from school for the most dojo points - Well Done!! We've been pretty busy in May. At the Bank Holiday weekend at the beginning of the month, Euan and Daddy headed down to Northumberland for a little camping trip. As usual it was fairly wet ... however they spent a fun packed day at Alnwick Castle and made the most of the opportunity to be indoors. They also managed to find time to visit Steve Clark and take Auntie Gillian out to dinner. Grandad and Flora arrived in Perthshire the following weekend - happily this coincided with Perthsire Rugby Club's beer festival - so a rather pleasant afternoon was spent at the North Inch. The next day was the club rugby tournament. Unfortunately, it was very wet and rather cold.. Euan's team sadly didn't get through to the final stages but they had good fun! In the middle of the month we headed up to Pitlochry to join Peter, Flora and Auntie Gillian at the Pitlochry Hydro Hotel. A very pleasant time was had by all! Euan took part in the Errol Bake Off on the 23rd - the category was 'farming' so Euan made a field and some animal cupcakes. The judges were obviously impressed and awarded him first prize. He was vey pleased with his certificate and rosette. Mummy was very pleased with the raffle prizes she won that day - a bottle of Prosecco and a new mixing bowl - everyone happy! Out in the garden not a great deal is happening. Daddy managed to cement the stones in place around the pond so this is looking quite smart. The vegetable patch is looking rather bare still - too cold for anything to grow. Here's hoping for some warmth and sunshine in June! Continuing with his houses and homes project. Euan took part in a clay buildings workshop in the village. He had great fun decorating a little section of clay brick wall with designs using natural earth paints...clarty mess....Euan also had the opportunity to visit Clayfest - the UK Earth Bulding Conference held here in Errol! Euans school trip was to Huntingtower Castle near Perth. He had a fascinating time learning about the lives of castle servants. Following on from this, a medieval day was held at school. Euan enjoyed dressing up as a servant boy but was less impressed with the 'banquet' - insufficient food as far as he was concerned! At the beginning of the month we headed down Cupar for Open Farm Sunday. The annual rally for Fife Vintage Agricultural Machinery club was part of this and Uncle Brodies old yellow combine was making a guest appearance - it looked like a little Dinky toy when it was lined up next to the massive modern combine. The weather for the school sports day was lovely and Euan excelled himself this year by coming third in the hula hoop skipping race! We went and had a look at some more old vehicles when the Dundee Classic Car Show was on at Errol Airfield. Almost every type of motorised transport was there; buses, fire engines, American cars, tractors, motorbikes..and so on. Euan and Mummy headed off to the Highland Show in the middle of the month. We went with a friend of Mummy, who had never been to an agricultural show before. It's safe to say we all had fantastic but quite tiring day. Already planning a trip to Perth show in August! Errol Primary School held a fabulous Summer concert in the church one evening. Mummy went along to here the singing - of course she knew all of the lyrics to the songs as Euan has been practicing them for several months! We headed off to Perth for a belated Father's Day outing for John. Euan and him enjoyed a wander round the model railway exhibition, whilst Mummy had the luxury of an opportunity to look rounds the shops unaccompanied for an hour! We met up a little later at the pub for dinner and much to Daddy's disappointment there was no Abbot beer...however he did settle for something else so all was not lost! Summer holidays!! That's Euan off school for six weeks! The first two weeks were spent at Errol Childrens Club. The children had lots of exciting activities to do including running a cafe on a couple of the days. Daddy went along to check out the coffee and sticky buns! The children also had trips to Blair Drummond Safari Park and Active Kids - both of which Euan really enjoyed. Mummy and Euan headed off to visit Auntie Margaret and Uncle Richard in Cornwall for one week. Although the weather wasn't great, it was certainly drier than being back in Errol! We visited the Eden Project which was really good. Euan tried out horse riding for the first time whilst we were in Cornwall - he certainly looked confident and definately enjoyed the experience. One of the highlights of the holiday was going to Port Isaac to see the Fishermens Friends play live (stopping off at Padstow en route for Rick Stein fish and chips!). The singing was fab and Euan was even more delighted to have his new CD autographed by a few of the dingers! Back home again, then Euan was off to stay at the farm for a couple of days. He made himself useful...helping Uncle Brodie with the sheep and Auntie Rosemary with the housework! I'm not sure if he stopped talking at any point whilst he was there though!! And finally....Euan has passed his Level 4 swimming. We were all delighted with this achievement and he is already working hard towards the next level. Last month of the Summer holidays!! We started the month with a visit to Perth Show. It was a little damp but we survived. Euan had a mishap whilst having a go on some mini quad bike but survived unscathed and recalled the 'crash' in great detail to Daddy when we got home! Mummy had a week off work with Euan and we pottered about doing odds and ends including a visit to Bash Street and the Verdant Works in Dundee. We also headed off to spend a few days with Rosie in Edinburgh and experience a little of the famous Edinburgh Festival. Euan made great friends with Rosie's Tibetan Terrier, Seamus - even going a far as asking if the dog could sit on his knee! On our visit we also went to the Foodie Festival - a whole day of grazing!! The following week, Daddy was on holiday, so they headed off for a 'boys only' adventure with the canoe. Great fun was had - see the photo's for proof!! Rugby training also restarted this month - on to tackling now - scary stuff!! We went down to Murrayfield at the end of the month to see Scotland v Italy World Cup warm up match. A great day out and a good final score. Euan was very enthusiastic with his support! Mummy had a lovely birthday in the middle of the month. We were lucky enough to be invited down to the farm for lunch to also celebrate Fay's birthday too! Euan started back to school on the 18th. Now in P4 with Mrs Mackinnon as his teacher - he seems to be happy with this! The following weekend was the P4 rugby groups day to provide support for the first XV team. Needless to say the weather was not the best but the team did very well. Mummy helped out with the tea and cake stall which was very well supported by the spectators desperate for a hot drink! Euan was also presented with 'player of the week' at one of the Sunday morning training sessions - he is really enjoying the full contact version of the game! Saturday 19th saw Euan and Mummy head to Dundee for their Doors Open event. We were very privaledged to be allowed up the spire of St Pauls and had some fantastic views over the whole of Dundee on a brillintly sunny day - then for a bit of contrast we paid a visit to the cells in Dundee Sheriff Court - thankfully they let us out again! Euan had a trial guitar lesson in the middle of the month but he wasn't particularly thrilled with it! It hurt his fingers too much!! The Doors Open weekend in Perth allowed us to visit another couple of churches, the Black Watch Museum and yet another court - we were released yet again! Euan had his swimming report from his new group - he has made great progress in most of the skills - Mummy and Daddy were very impressed! Happy birthday to Daddy this month - his gift of a brand new road atlas came in very handy later in the month when we were on holiday! He even had a birthday cake with a heart on it! We had a visit from Maxine and Linda from Belford. Euan was delighted to have visitors and never stopped talking the whole weekend ....even more so than Maxine and that's no mean feat! We popped into Dundee to visit the RSS Discovery - I think they were grateful the ship they travelled to Antarctica on earlier in the year was more modern! Two weeks of school holidays for Euan in the middle of the month. He spent the first week at Errol Childrens Club and had great fun making a life sized superhero. He also made a toffee apple but after one bite had decided it wasn't for his taste! The following week we all headed off to Sherwood Forest - see Daddy's blog about this bit! Uneventful journey down after delivering the Skoda to the garage for some minor repairs and then failing to get the tickets to open the barriers at Perth station. Once we arrived, it was straight into the hot tub, marvellous. A trip to the National Space Centre in Liecester, via Nottingham to plan Thursday's excursion. The space centre was very noisy and full of school children on a visit. Back to the cabin for a scrummy tea, followed by a game of Scrabble, which Euan won. A long day out to vist Uncle Bob and take him out for a bite of lunch. Quote of the day from Mummy, said on several occasions, "i'm very glad you're driving, not me". Excellent pizza from the on site cafe for tea. Cadbury World - what more do we need to say? Drove to Nottingham and used the trams from the park and ride to get to the station, amazing. Another long day out so we settled for a curry for tea, with a quick dip in the hot tub whilst waiting for it to be delivered..
Sherwood Forest, a quick look round before returning the hire car and getting on the train to come home..
Shetland Granny came to visit in November. Euan guided her round the farmers market in Perth and pointed out all of the stall where a free tasting was available! Euan was playing rugby at Dunfermline on the Sunday so Granny came to watch before we took her back to the farm. Mummy and Uncle Brodie went to Kingsbarns distillery for a tour on the 14th. This distillery isn't a year old yet but we did get to sample some Weymss Malts from their parent company. Very nice! Euan had a few days off school in the middle of the month so we popped down to Leeds to visit Colette and Laura. We enjoyed a trip to Skipton where Euan had a pork pie which he announced was the best ever! Of course it was Euan's 8th birthday on the 25th and Mummy managed to produce the birthday cake as requested "A desert island surrounded by shark infested custart with an armadillo on the beach"! We also managed to have high tea at the Royal George hotel in Perth as part of the birthday celebrations too! Gosh the last month of 2015 already! 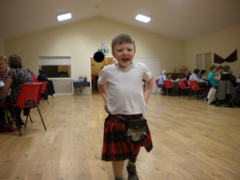 Lots of things were happening in December though - Euan helped Mummy with her stall at the school Christmas Fayre. He was a very good salesman and even had his share of the profits! Other festive activities included a trip to the pantomime, Christmas lunch and class party. Mummy had a trip to Edinburgh with her friend Jane to see the Christmas market and a few hostelries! Meanwhile, at home, whilst Mummy was away, Daddy and Euan ate pizza, watched Top Gear and downloaded a fart noise app onto the gadget! Euan has passed his level 5 swimming award and now moves to a new group on a Thursday evening in the new year. We all had a lovely Christmas with lots of nice gifts and plenty of good food. We popped down to the farm on Christmas day for mulled wine and snacks. It was lovely to see everyone there. Mummy was back to work in the days between Christmas and New Year so Daddy was 'in charge'. One of the treats was a visit to the cinema to see the new Snoopy movie - both enjoyed this very much! Copyright © 2015 Jolly John. All Rights Reserved. Designed by John Steven.